Old school D&D is a game about tourists. The basic premise of the first few editions of Dungeons & Dragons is fairly simple. Some dudes wander into some foreign, alien environment in order to explore it, for whatever reason. Who these dudes are, or if they’re even dudes, doesn’t matter. It’s the dungeon that really matters. I’ll be referring specifically to Basic D&D (Moldvay/Mentzer) throughout this article, and I’ll just assume all of this applies to the original and Holmes editions as well. 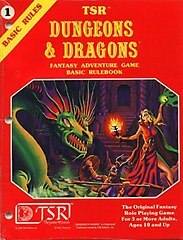 Before every game of Basic D&D, including the very first one, the DM must prepare a dungeon, either by creating one or by reading one created by someone else. This is usually done without reference to the players’ characters. The DM may not even know who will be playing, much less what characters they will play. Players may be creating their characters at the beginning of the game, and they may end up playing more than one character in the same dungeon, because of casualties. This dungeon is a static situation for the players to discover. During play, the DM sets parts of this static situation into motion based on what the players decide their characters do. The DM also uses random charts to introduce new situations during the game. The DM is expected to adjudicate fairly and be faithful to the dungeon as it is written. So the focus is on the dungeon from the very beginning. Without a dungeon, there’s no game. Without players, the dungeon is still waiting for characters to enter it. What the players do (and don’t do). Characters are assumed to want treasure. This is a game about killing monsters and taking their stuff, right? No. If you don’t want to do that, you can still play the game, as it’s written. You can run away from monsters, or avoid them altogether, and sometimes that’s actually the wisest course of action. You don’t have to pick up any of the treasure, either. You could just leave it and check out the wall paintings instead. One of the most popular rules variants for D&D is how experience points are awarded. In Basic D&D, characters receive most of their xp from treasure. In other editions, monsters are a major source, and in various house-rules, completing quests and role-playing get you xp. Thing is, the DM doesn’t even have to write any new rules or make any difficult rulings if the players don’t want to kill monsters or take stuff, or even collect xp at all. It’s not the reason characters exist, it’s just how they get better. And so they don’t have to get better, either. The endless circles of efficiently overcoming obstacles so you can get more stuff that will help you overcome obstacles more efficiently is certainly there, but it’s not necessary. The characters do have to go into the dungeon, but they don’t have to level up. Who gets to say what. Because the characters are venturing into a foreign setting, dividing narrative responsibilities is fairly easy. Players say what their characters do, the DM handles the whole setting. Characters are experiencing the dungeon for the first time, so of course players do not describe any part of the setting. Character background is pretty much irrelevant—only their actions while they explore the dungeon matter—so players are not expected to invent new narrative elements, by which I mean proper nouns: people, places, or things. After they name their character and decide what he or she looks like, they are only ever interacting with narrative elements, not introducing new ones. The DM does all the creation and introduction of elements. The players manipulate them. The main advantage to this system is that it’s easy for players to get into. Because players are only tasked to make decisions and interact with the DM’s fictional creations, there’s much less trepidation to participate. This is only enhanced by the disposable nature of characters. They are easy to create and players have little or no immediate attachment to them. Which means it’s still a fun time when your character is killed in a gruesome, heroic, or even hilariously pointless manner. Your character is simply your gateway into someone else’s fantastical imagination. If you lose one, you just make another and dive back in. And while this puts most of the weight on the DM, there are plenty of tools to make that job easier. Not only whole modules and instructions for how to make them, but hundreds of other types of information are available through the wealth of the internet and the history of published games. Of course, the game has constraints and when you step beyond them, play runs less smoothly. Some of the problems and complaints that arise out of old school D&D include the game of character building, a lack of familiar settings, a lack of player input, a lack of focus on characters and their narrative arcs, and railroading. All of these will be the subject of future blog posts. Another thing that having the DM control all the information does is let D&D become a game of pattern discovery like Mastermind, as howandwhy99 has suggested (on the OD&D boards, and interpreted by me in the link I used for a sig above, with some follow-up comments there by him). I think that the more a game uses improv techniques (like making reaction rolls for wandering encounters) and sandbox playstyles incl. out-of-dungeon action like carousing (where the characters can choose actions that matter to them), the more that player input matters and the less it’s a pure game of finding the pre-ordained patterns. Something like the super-minimal key of the early-70s Blackmoor Dungeon demands improv to bring to life, and the more you allow sandbox freedom the more you’ll get into situations where you need to rely on improv rather than pre-planned materials. In such cases, player input operates below the surface: “OK, the dice say elves, and they’re hostile, why? Maybe the caravans the players are sending are disrupting their hunt…” I like this below-the-surface level of engagement because I find it breaks my immersion to be required to think of the narrative, rather than just how my character experiences it. Looking forward to the rest of the promised posts! And there’s a couple more things I need to write about!